A cycling team competing at the Vuelta a Espana had their bus destroyed in an apparent arson attack before the start of Thursday's stage 12 in Spain. The Irish team said there were no injuries caused by the incident. 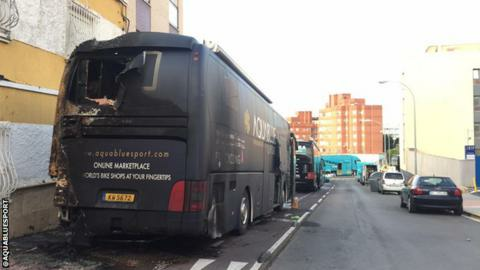 "Our team bus has been completely damaged in a cowardly arson attack overnight," they tweeted. Race organisers have provided a replacement for Thursday's 160.1km ride from Motril to Antequera. "Nothing is going to stop us starting today's La Vuelta stage. Thank you for all the support," the team added. Britain's Chris Froome of Team Sky is the current overall leader, with the 32-year-old one minute and 19 seconds ahead of Italian Vincenzo Nibali. Froome is biding to become only the third man, after the French duo of Jacques Anquetil and Bernard Hinault, to have won both the Tour de France and the Vuelta a Espana in the same season.